Home » Posts tagged "Stefano Langone"
The numbers are all low because the average prior scores for this group is much higher than previous seasons. This really is a very talented group. The probabilities don’t add up to 1 as a result. 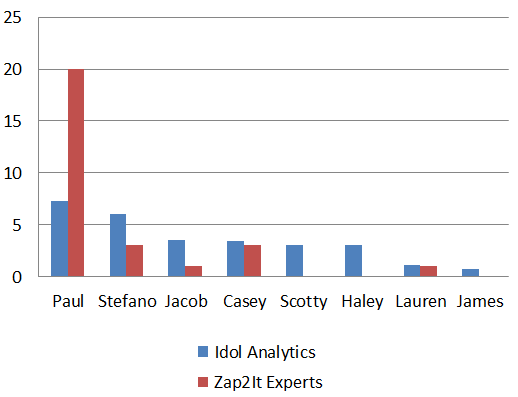 Nevertheless, the model thinks Stefano is more than twice as likely as his nearest competitor, Paul, to go home. He needs to really kill it if he wants to stay in the game.